–– A case of mere homonymy or identifiable common commitments? In philosophical language, the word realism is a polysemic and fundamental notion. One can be a realist, as opposed to an idealist, if one defends the view that material objects exist externally to us and independently of our sense experience; one can be a direct realist in the theory of perception if one holds that perception is a direct awareness of external objects, a moral realist if one believes that there are objective moral values, a scientific realist if one holds that scientific knowledge is about theory-independent phenomena and that such knowledge is possible even about unobservable entities, a modal realist if one believes that possible worlds are as real as the actual world. In ontology, realism indicates the fact that one grants – in ways which vary greatly from case to case – extra-mental existence to certain kinds of entities, such as universals, relations or propositions. The conference aims at exploring the relations that the different positions referred to as “realism” may have to each other. We wish to provide an answer to the question: are the many ways in which theories can be qualified as “realist” merely homonymic or is/are there one or more common commitment/s which ground the use of the same word? In particular, are there any interesting connections, historical and/or systematic, between two (apparently quite different) debates around the notion of realism, that about universals and that which opposes realism to idealism? When, and how, the realism vs. idealism debate emerged, and did the realism vs. nominalism debate play any role in this emergence? The conference, organized at the Helsinki Collegium for Advanced Studies, will explore these issues both from an historical perspective, focussing on the Middle Ages and Modernity, and from a systematic perspective based on contemporary debates. 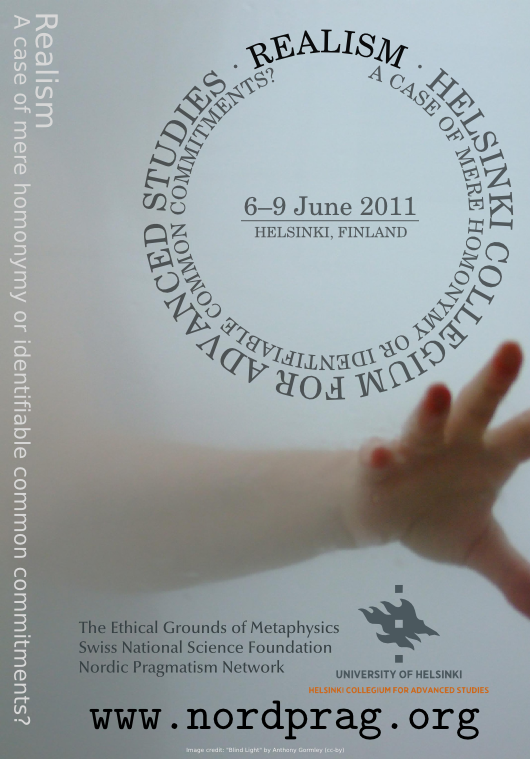 The conference takes place at the Helsinki Collegium for Advanced Studies on the Central Campus of the University of Helsinki (Fabianinkatu 24, 1st floor, seminar room 136) in 6-9 June 2011. The conference will consist of two parts: the first three days (6-8 June) are reserved for invited presentations only. They include five sessions: two historical and three systematic, with 3-4 papers each. On the final day (9 June) the Nordic Pragmatism Network organizes a one-day follow-up symposium on “Pragmatism and Realism”, concentrating on the issue of realism with an emphasis on the philosophical tradition of pragmatism. Rooms at Hotel Radisson Plaza (Mikonkatu 23) have been reserved for the participants of the conference. The organizers invite paper proposals to the workshop “Pragmatism and Realism” arranged as part of the conference on 9 June 2011. Please send an abstract of 150-300 words to info@nordprag.org by 1 April, 2011. The organizers reserve the right to select presentations based on quality, interest and suitability to the overall conference theme. A time slot of about 30 minutes will be allotted for each paper. Please note that this programme is provisional and subject to changes. Did Sherlock Holmes Inhale Pipe Smoke Through a Hole In His Forehead? What is real? Presumably, whatever actually exists. But how is existence expressed? According to the modern conception that goes back to Russell, what exists are the members of our universe of discourse. But that cannot be simply a class of actual objects, for we have to consider objects as potential, identifiable members of other possible worlds. Now the criteria of identification are independent of actual existence. Hence our universes of discourse can (and must) contain also merely possible objects. For thinkers like Aristotle, they were epistemologically possible ones. In general, the borderline between what is potential largely disappears. This is illustrated by ongoing physical theorizing. Jaakko Hintikka is Professor of Philosophy at Boston University and a Distinguished Visiting Fellow at the Helsinki Collegium for Advanced Studies. He is known as the main architect of game-theoretical semantics and of the interrogative approach to inquiry, and also as one of the architects of distributive normal forms, possible-worlds semantics, tree methods, infinitely deep logics, and the present-day theory of inductive generalization. He has authored or co-authored over 30 books and monographs that have appeared in nine languages. Five volumes of his Selected Papers (Kluwer Academic) appeared in 1996-2003. Jaakko Hintikka has edited or co-edited 17 volumes and authored or co-authored over 300 scholarly papers. A comprehensive examination of his thought appeared in 2006 as the volume The Philosophy of Jaakko Hintikka in the series Library of Living Philosophers. The honors Hintikka has received include the John Locke Lectureship at Oxford (1964), the Hägerström Lectureship at Uppsala (1983), the Immanuel Kant Lectureship at Stanford (1985), the Wihuri International Prize (1976), a Guggenheim Fellowship (1979-80), and honorary doctorates from the University of Liège (1984), the Jagiellonian University of Cracow (1995), and the Universities of Uppsala (2000), Oulu (2002), and Turku (2003). Most recently, he has been awarded the Rolf Schock Prize for Logic and Philosophy (2005) for his pioneering contributions to the logical analysis for modal concepts, in particular the concepts of knowledge and belief. This paper examines Aristotle’s account of sense perception. It aims to demonstrate that Aristotle was committed to a certain version of direct realism, commonly referred to as naïve realism. This position is to be contrasted with another version of realism known as representative realism, which is attributed to Aristotle, in various ways, by a number of interpreters including Franz Brentano. In this interpretation, Aristotle held what is sometimes called the common factor view about perception. This means that Aristotle’s account of perceiving as ‘receiving the Form without the matter’ (see De Anima B 12, 42418–19) should be taken to apply in exactly the same way to veridical and non-veridical cases of perception. The present paper questions this interpretation, arguing that it is incompatible with the way in which Aristotle explains perception as a kind of change in the light of his general theory of causation. The main argument will be that, according to Aristotle, veridical and non-veridical perceptions cannot be changes of the same type because they have different causes, and the cause is that which determines the type of each change. Dr Mika Perälä is a postdoctoral fellow at the Philosophical Psychology, Morality and Politics Research Unit, University of Helsinki. He defended his dissertation on Aristotle’s account of perceiving that we perceive in Helsinki, 2010. Porphyry’s list of questions on the status of genera and species (Isagoge, ch. 1) is currently regarded as the foundational text for the later debates on universals. In his commentaries on Aristotle, however, Porphyry (3rd century CE), heavily relies on previous Peripatetic debates, from the 1st century BCE onwards. In the present paper I will compare Boethus of Sidon’s (1st century BCE) reading of the notion of universal substance in Aristotle’s Categories to that made by Alexander of Aphrodisias (2nd-3rd century CE). As I aim to show, their different interpretations set the background for the subsequent debates on the ‘problem of universals’. Boethus is heavily influenced by Hellenistic Stoic views. Accordingly, he conceives of Aristotle’s ‘second substances’ in the Categories as mere collections of particulars; furthermore, he rejects the substantiality of the hylomorphic form. Qualified particulars are thus the only components of Boethus’ world. Alexander of Aphrodisias’ theory of essence can aptly be seen as a reaction against Boethus’ nominalism. According to Alexander, while universals do not exist as such, they cannot simply be reduced to particulars. Rather, we should connect the fact of being ‘universal’ to the way in which hylomorphic essences exist and are thought of. Alexander’s essentialism can be seen as a form of ‘moderate realism’. Riccardo Chiaradonna (PhD 2001) is Associate Professor of Ancient Philosophy at the University of Roma Tre, Rome. He has been invited lecturer at the Ecole Normale Supérieure, Paris. Chiaradonna has published extensively on Ancient Philosophy from the 1st century BCE to late Neoplatonism. His areas of interest include: Plotinus, the ancient commentators on Aristotle, Galen and ancient medical epistemology. Chiaradonna’s publications include the books Sostanza movimento analogia, Plotino critico di Aristotele (Naples, 2002), and Plotino (Rome, 2009). Together with Franco Trabattoni he has edited Physics and Philosophy of Nature in Greek Neoplatonism (Leiden, 2009). Among his papers are ‘Before and after the commentators: an exercise in periodization’ (with Marwan Rashed), Oxford Studies in Ancient Philosophy, 38, 2010, p. 251-297; and ‘What is Porphyry’s Isagoge?’, Documenti e studi sulla tradizione filosofica medievale, 19, 2008, p. 1-30. 1. Immanence realism about universals, which states that a specific or generic universal is completely realised in each individual which belongs to the given genus or species. 2. An understanding of matter as composed of intelligible (‘immaterial’) properties. Gregory holds that matter (and bodies) consist of qualities which are thoughts (ennoiai) and bare concepts (noemata). Eriugena believes that incorporeal categories generate material reality and are the basic constituents of matter (‘matter is nothing else but a certain composition of accidents which proceeds from invisible causes to visible matter’, Periphyseon 479B). Eriugena holds a third thesis: the true being of a thing is the knowledge God has of it. The aim of this talk is to discuss these theses, in order 1) to reconstruct the analysis of reality set forth by these two authors, in particular their position on the issue of extra-mental material substances; 2) to discuss the possible entailment links which may exist among these theses; 3) to discuss the relevance of the concept of ‘idealism’ to qualify aspects of these positions, and 4) more widely, to examine the link between the problem of universals and discussions on the status of the sensible world. Christophe Erismann is SNF professor of medieval philosophy at the University of Lausanne, where he leads a research project devoted to the Aristotelian category of relative, with emphasis on the early medieval inquiry about relations. After a PhD thesis on the genesis and constitution of early medieval realism about universals, he has held research positions at the Warburg Institute (University of London), at the University of Cambridge and at the Helsinki Collegium for Advanced Studies. He has published several articles on the problems of essence, universals and individuation during the Late Antiquity and the Early Middle Ages. Late medieval logicians and metaphysicians distinguish between two ways of being universal: in significando and in essendo. While nominalists restrict universality to the first type, realists tend to explain the first in terms of the second type. The aim of the paper is to give a critical account of the realists’ arguments in favour of the existence of non-linguistic universals, i.e. for the thesis that in spite of the fact that universality is always manifested in thought and language, it isn’t primarily semantic. This will be done on the base of texts from Thomas Aquinas, John Duns Scotus, Walter Burley, Richard Brinkley, Nicolas of Autrécourt and John Wyclif. In addition, one will discuss Armstrong’s suggestion that some medieval realists offered an anticipation of his advocated a posteriori (or scientific) realism of universals. Laurent Cesalli – born in 1968 in Vevey, Switzerland – studied philosophy and musicology (1988-1993 Fribourg, Switzerland) – trained as a mountain guide (1994-1997) – bike trip from Geneva to Beijing (1995-1996) – PhD in philosophy on propositional realism in late medieval thought (2003, Geneva, dir. by A. de Libera) – from 2004 to the present, teaches philosophy at the University of Freiburg i. Br. (Germany) – lecturer in philosophy (Geneva 2008-2011) – currently involved in a research project on formal semantics and natural language in medieval philosophy (Geneva, with Alain de Libera and Frédéric Goubier) – is writing a “Habilitation” on Anton Marty’s philosophy of language and the Austro-German tradition (due for 2012). In this paper I will revisit Descartes’s account of the formal and objective reality of ideas. For Descartes, as for the Scotist tradition in general, ‘real’ means something that can be a ‘res’: to be real is to be possible. The reality of some possible thing is expressed by its essence which is reflected in its ‘objective reality’. Objective reality comes in degrees. Some ‘real’ entities also have actuality as a result of being caused. This is their ‘formal reality’. For Descartes certain ideas (e.g. God) have an objective reality so great that it can be accounted for only by them also having formal reality. Other ideas have objective reality but fail to have a formal cause and even mislead in presenting the kind of objective reality they possess. These are ‘materially false’ ideas. The general view is that Descartes’s employment of these Scholastic notions is confused and that Antoine Arnauld in his Objections makes a number of valid criticisms of Descartes’s account. I shall suggest that Descartes’ distinctions offer powerful insights into his understanding of the meaning of reality. Professor Dermot Moran holds the Chair of Philosophy (Metaphysics & Logic) at University College Dublin and is a Member of the Royal Irish Academy. A graduate of University College Dublin (BA, 1973) and Yale University (PhD, 1986), he has previously taught at Queen’s University Belfast and Maynooth College, and has held visiting professorships at Yale University, Connecticut College, Rice University, and Northwestern University. Prof. Moran has published widely on medieval philosophy (especially Christian Neoplatonism) and contemporary European philosophy (especially phenomenology). His books include: The Philosophy of John Scottus Eriugena (Cambridge: Cambridge U. P., 1989; reissued 2004), Introduction to Phenomenology (London & NY: Routledge, 2000), and Edmund Husserl. Founder of Phenomenology (Cambridge & Malden, MA: Polity, 2005). He has edited Husserl’s Logical Investigations, 2 vols. (Routledge, 2001), The Shorter Logical Investigations, The Phenomenology Reader, co-edited with Tim Mooney (Routledge, 2002), Phenomenology. Critical Concepts in Philosophy, 5 Volumes, co-edited with Lester E. Embree (Routledge, 2004), Eriugena, Berkeley and the Idealist Tradition, co-edited with Stephen Gersh (University of Notre Dame Press, 2006), and The Routledge Companion to Twentieth Century Philosophy (Routledge, 2008). Prof. Moran is Founding Editor of The International Journal of Philosophical Studies. Kenneth R. Westphal is Professorial Fellow in the School of Philosophy, University of East Anglia, Norwich. He has published widely on both Kant’s and on Hegel’s practical and theoretical philosophies. His recent books include Kant’s Transcendental Proof of Realism (Cambridge, 2004); he is editor of The Blackwell Guide to Hegel’s Phenomenology of Spirit (Blackwell, 2009). His current research in theoretical philosophy includes: ‘Philosophizing about Nature: Hegel’s Philosophical Project’, in The Cambridge Companion to Hegel and Nineteenth Century Philosophy (2008); ‘Kant’s Critique of Pure Reason and Analytic Philosophy’, in The Cambridge Companion to Kant’s Critique of Pure Reason (2010); ‘Self-Consciousness, Anti-Cartesianism and Cognitive Semantics in Hegel’s 1807 Phenomenology’, in The Blackwell Companion to Hegel (2011), „Urteilskraft, gegenseitige Anerkennung und rationale Rechtfertigung“, in Ethik als prima philosophia? (2011); and ‘Kant’s Cognitive Semantics, Newton’s Rule Four of Philosophy and Scientific Realism’. Gottlob Frege made a sharp distinction between psychological acts, such as thinking and judging, and the contents of those acts. Frege was not alone with his views in the nineteenth century. Bernard Bolzano, for example, had argued along similar lines as early as 1837. Frege also distinguished between the thought, the judgment, which is the acknowledgment of the thought, and the assertion, which is the linguistic expression of the judgment. In his Ideen I (1913) Edmund Husserl distinguished between judging as an empirical mental process, the judgment-noesis, taken as an essence, and the judgment-noema or the proposition as the correlate of the judgmental mental process. In this paper I will first outline a constructivist interpretation of Husserl’s distinction and discuss it from a Fregean point of view. I will then analyze and evaluate the commitments that the constructivist and the realist view of judgments have concerning the concept of rationality. Leila Haaparanta is Professor of Philosophy at the University of Tampere and Docent at the University of Helsinki. She is the author of Frege’s Doctrine of Being (Acta Philosophica Fennica, 1985) and the editor of Mind, Meaning and Mathematics (Kluwer, 1994), The Development of Modern Logic (Oxford, 2009), and Rearticulations of Reason (Acta Philosophica Fennica, 2010). Her co-edited works include Frege Synthesized (with J. Hintikka, Reidel, 1986), Analytic Philosophy in Finland (with I. Niiniluoto, Rodopi, 2003), and Categories of Being: Essays on Metaphysics and Logic (with H. J. Koskinen, Oxford, forthcoming). She has published articles on the history and the philosophy of logic, early twentieth century analytic philosophy and phenomenology, epistemology, philosophy of mind, philosophy of religion, and pragmatism. She has led research projects on the history of logic, on twentieth century philosophy, and on rationality. She is a member of the Steering Committee of the European Society for Analytic Philosophy. I will be concerned in this paper with whether naturalism can be cogently maintained in the absence of metaphysical commitments. By ‘naturalism’ I mean here scientific naturalism, the view that science – natural science – is our unique source of fundamental knowledge and explanation. Traditionally such a naturalism has been associated with metaphysical realism, but for reasons I will explain I find this combination untenable. I go on to argue that there is in fact little reason in science itself for thinking a metaphysical grounding of the various bodies of knowledge we call science is required, a result that might seem to render my original question anodyne. But that would be a superficial assessment. Trying to understand the kind of pluralism I claim science exhibits in a scientific way leads one back into metaphysics, of a kind which though different from realism is equally problematic. On the other hand, if one demurs at giving such a scientific account, how can one seriously maintain naturalism? In the final part of the paper, I will sketch what I see as the most promising way of responding to this latter question. Jonathan Knowles is professor of philosophy and Head of the Philosophy Department at the Norwegian University of Science and Technology in Trondheim, Norway. He studied at the universities of Oxford, Edinburgh and London, gaining his PhD in 1995 with a thesis on the philosophy of cognitive science and linguistics. He held a post-doctorate at the University of Oslo from 1998-2000. He has written Norms, Naturalism and Epistemology: The Case for Science Without Norms (Palgrave 2003) and papers on folk psychology and explanation, linguistic knowledge and competence, reduction in psychology and science, naturalistic theories of norms, the nature of naturalism, and realism and naturalised epistemology. He sits on the board of the Nordic Pragmatism Network. Uskali Mäki is an Academy Professor at the University of Helsinki (2006-2011). Ilkka Niiniluoto is, since 1977, Professor of Theoretical Philosophy at the University of Helsinki. He was Rector of the University of Helsinki in 2003-2008 and is, since 2008, Chancellor of the University. His main publications include Truthlikeness (1987) and Critical Scientific Realism(1999). By classical realism I mean non-sceptical Scholastic philosophy, whether Aristotelian of Augustinian, and by weaknesses those realist assumptions which were particularly criticized when this approach began to be critically discussed in late medieval and early modern times. My aim is to identify and characterise these points as well as add some considerations about the background and justification of their criticism. Simo Knuuttila is Professor of Theological Ethics and the Philosophy of Religion at the University of Helsinki. His publications include Modalities in Medieval Philosophy (1993) and Emotions in Ancient and Medieval Philosophy (2006). The philosophy of epistemological realism and the philosophy of universals make extensive use of the notion of (in)dependence. Unfortunately they rarely employ any philosophy of (in)dependence. In order to remedy this defect it is essential to distinguish theories of (in)dependence and theories of the terms of this relation or tie. I propose an account of existential relativity or dependence, distinguish between the claim of many analytic philosophers (“responce-dependence theories”) that certain universals (properties, concepts) depend on certain attitudes and the claim (of many early phenomenologists) that certain universals (properties, concepts) depend on certain types of object (persons, human beings, organisms) and argue for the superiority of the latter approach. Finally, I consider the relation between the concept of (in)dependence and the concept of reality and the suggestion by philosophers from Maine de Biran to Scheler that the origin of the concept of reality is to be found in experience of resistance. Indirect evidence in favour of this suggestion is, I hazard, the penchant of postmodernists to see what is in fact hard and unyielding as soft and pliant, “constructed” as contemporary cant has it. Kevin Mulligan, ordinary professor of analytic philosophy at the University of Geneva since 1986, is Chairman of the Department of Philosophy and Deputy-Director of the Swiss NCCR in affective science. His publications are in the areas of metaphysics, the philosophy of mind and the history of Austrian Philosophy from Bolzano to Wittgenstein and Musil. His hobby is the deconstruction of Continental Philosophy. As readers of literature or philosophy, we never “just” read. Instead, we plug giant semantic holes in the text, most often falling back on something like a Reality Principle. Problem is, sooner or later the Reality Principle goes wrong, at which point the interpretation of what we read goes south. Armed with a couple of timeless classics, Bambi and 101 Dalmatians, I will show not only that Sherlock Holmes did not inhale pipe smoke through a hole in his forehead (which you knew anyway) but why this is so—and why it matters. Indeed, the repercussions could not be more dramatic for the way we do philosophy and, even more so, for the way we often fail to do it right. Peter Swirski is Research Director at the Helsinki Collegium for Advanced Studies, Professor at the University of Missouri-St. Louis, and Honorary Professor at Jinan University, China. His research ranges from American Literature and American Studies to interdisciplinary studies in literature, philosophy, and science. He is also the world’s foremost critic on the late writer and philosopher, Stanislaw Lem. Featured on European, Russian, and Chinese TV, he is the author of twelve acclaimed books, including the bestselling From Lowbrow to Nobrow (2005) and Ars Americana, Ars Politica (2010), as well as, in a more analytical-philosophical vein, Between Literature and Science (2000), Of Literature and Knowledge (2007), and Literature, Analytically Speaking (2010). His work has been reviewed from The New York Times Book Review to the Financial Times and from Philosophy and Literature to the International Journal of Philosophical Studies. With the tolerance and experimental spirit endorsed by early Quine, I raise certain issues having to do with realism in the specific context of substance dualism and person-body asymmetry. I am interested in an ontological framework which assigns on the mental side to persons the status of non-composite, primitive, or simple substances. Person-body symmetry is then understood in terms of the fundamentality of substances and interpreted via the notion of identity-dependence. I will first argue that the asymmetric options where there are (i) only composite substances on the physical side of bodies, or even (ii) no physical substances at all, are indeed consistent formulations of substance dualism. What then remains to be seen is the compatibility of (i) and (ii) with the doctrine of realism. If being real is equated with being mind-independent, then at least option (ii) appears problematic. On the other hand, if realism is conceived as a general commitment to the existence of basic or fundamental entities, and thereby contrasted with ontological relativism or conventionalism, then despite certain counter-intuitiveness, both (i) and (ii) are fully compatible with realism. Heikki J. Koskinen, Dr.Phil., completed his formal studies at the University of Helsinki, where he majored in theoretical philosophy and took advanced studies in cognitive science. Koskinen’s doctoral dissertation From a Metaphilosophical Point of View: A Study of W. V. Quine’s Naturalism (2004) was published as volume 74 of Acta Philosophica Fennica. Recent publications include “Quine and Pragmatism” (2006) with Sami Pihlström in Transactions of the Charles S. Peirce Society, Vol. 42 No. 3, and “Logical Analysis and Its Ontological Implications in Quine” (2010) in Acta Philosophica Fennica 88. At present, Koskinen is a member of the Academy of Finland research project “Judgement and Human Rationality”, works as the coordinator of the Finnish Doctoral Programme of Philosophy at the University of Tampere, and co-edits with Leila Haaparanta an anthology of new contributions by twenty scholars titled Categories of Being: Essays in Metaphysics and Logic, forthcoming from Oxford University Press. This paper has two parts. First, I will present a brief historical survey of what I call, echoing one of W.V. Quine’s famous papers, seven “milestones” in the historical development of the problem of realism. The final milestone I will arrive at is the pragmatist one – or, more precisely, an integration of Kantian and pragmatist approaches to the realism issue. In the second half of the paper, I will examine one possible way of cashing out the pragmatic attitude to this issue, and of thus articulating a distinctively pragmatist approach to metaphysics. This is what I call the (pragmatic) contextuality of the notion of ontological scheme-/practice-dependence (and, similarly, of scheme-independence). While the first half of the essay will go through a very long historical development in extremely broad strokes, the second half will offer a more focused (albeit relatively abstract and general) look at how the outcome of this development could, or should, be reconceptualized in contemporary philosophy. Sami Pihlström is, since 2006, Professor of Practical Philosophy at the University of Jyväskylä and, since 2009, Director of the Helsinki Collegium for Advanced Studies. He has published widely on the problem of realism and related matters, including the pragmatist tradition in particular. His recent books include Pragmatist Metaphysics: An Essay on the Ethical Grounds of Metaphysics (Continuum, 2009) and Transcendental Guilt: Reflections on Ethical Finitude (Lexington Books / Rowman & Littlefield, 2011), as well as the edited volume, Continuum Companion to Pragmatism (Continuum, forthcoming 2011). He is one of the Executive Editors of Sats: North European Journal of Philosophy and the Book Review Editor of the Transactions of the Charles S. Peirce Society. Putnam claims that my “dismissive attitude” to Dummett’s antirealism is “as unphilosophical as Samuel Johnson’s stone-kicking.” Dummett is delighted, going on to describe my argument as “a severe case of ignoratio elenchi.” This paper responds to these charges. Both Putnam and Dummett have carelessly ignored my actual argument. I present this response against a background that summarizes the following earlier criticisms of Putnam’s discussion of realism: (i) that Putnam conflates the metaphysical issue of realism with the semantic issue of correspondence truth; (ii) that he wrongly gives priority to the semantic one; (iii) that he embraces the popular but nonetheless bizarre neo-Kantian doctrine of constructivism. Michael Devitt is an Australian who received his early education in England at Bradfield College. He received his BA from the University of Sydney (1966) and his PhD from Harvard University (1972). His main research interests are in the philosophy of language, philosophy of linguistics, philosophy of mind, realism, and methodological issues prompted by naturalism. He is now a Distinguished Professor of Philosophy at the Graduate Center of the City University of New York. Before that he taught at the University of Maryland (1988-1999) and the University of Sydney (1971-1987). He has published the following books: Designation (1981), Realism and Truth (1984/1991/1997), Language and Reality (with Kim Sterelny, 1987/1999), Coming to Our Senses (1996), The Blackwell Guide to the Philosophy of Language (co-edited with Richard Hanley, 2006), Ignorance of Language (2006), Oxford: Clarendon Press, 2006, Putting Metaphysics First (2010). A commitment to some version of naturalism is characteristic of various forms of pragmatism. Huw Price offers a view where this commitment plays a central role, arguing that appropriate sensitivity to science requires us to be subject naturalists. In a recognizably pragmatist move, Price relies on this interpretation of naturalism, in the form of global expressivism, to dismiss metaphysics conceived placement problems. Richard Rorty also articulates his opposition to metaphysics in naturalist terms. However, while endorsing subject naturalism, Rorty insists that science be given no philosophical privilege. Naturalism, in Rorty’s rendition, is a cultural-political stance, justified in so far as it supports liberal democracy and serves to discredit authoritarian modes of thought. But can we have it both ways? Can pragmatists be scientific naturalists and political naturalists with equanimity? Bjørn Ramberg received his PhD in philosophy from Queen’s University (Kingston, Ontario) in 1987, with a thesis on the work of Donald Davidson (Donald Davidson’s Philosophy of Language, Blackwell, 1989). He was a Mellon Faculty Fellow at Harvard (1990/91) and a member of the Philosophy Department at Simon Fraser University (1991-2000), before becoming Professor of Theoretical Philosophy at the University of Oslo (1997). He has published papers on various aspects of pragmatism, interpretation and meaning, focusing mainly on work by Richard Rorty and Donald Davidson. His current research addresses questions regarding the nature of subjectivity, drawing on developments in psychology, ethology, and linguistics, as well as philosophy. Bjørn Ramberg is a member of the Core Group at the Centre for the Study of Mind in Nature (CSMN, a National Research Council of Norway Centre of Excellence) at the University of Oslo. Ontological realism and realism about universals may reasonably be regarded as two separate and logically independent doctrines. One historical place, however, where they do intersect one another is in the Christian line of interpreting and inheriting Plato from the early church Fathers up to Romantic commentators of Christianity such as Samuel Taylor Coleridge. According to Coleridge, Christianity embodies universal truths, nonhuman in origin yet knowable to human reason via intellectual intuition, a faculty whose possibility Kant famously denied. While none of the three classical American pragmatists were directly part of this tradition, the Platonic line of religiously inclined ontological realism enters the stream of American philosophy via the work of Ralph Waldo Emerson. The paper discusses Emerson’s notion of the moral sentiment, how this may be read on the one hand, in the footsteps of Coleridge, as an intellectual faculty of directly intuiting universal truths, and on the other as a non-human real force operating in reality. It is particularly in the latter respect that I will suggest Emerson’s work to bear a close relationship to that of Charles S. Peirce, whose affinity with Emerson has recently aroused increased interest among scholars. Realist views about normative issues, such as moral realism, are often characterized as a conjunction of two theses. The first is the semantic or conceptual thesis that normative judgments are made true by normative facts. The second is the ontological thesis that there are such facts. This second thesis is often supplemented by the further condition that these facts are mind-independent (in a suitable sense). In this paper, drawing from classical pragmatists, especially Charles S. Peirce, and also to some extent from more recent pragmatist views, I argue that the worst pitfalls of metanormative realism are due to the first claim, and that the second claim can and should be developed independently of it. Henrik Rydenfelt is a research in Theoretical Philosophy at the University of Helsinki currently finishing his dissertation with the title A Prolegomena to Normative Science. He is also the coordinator of the Nordic Pragmatism Network. How do we know whether something we experience is real or not? There is always the odd chance that our senses have been misguided and what we perceive to be real is, in fact, illusory. Nonetheless, we go about our business day to day with no problem in telling apart the real from the unreal. In this presentation, I study the nature of the real and the role of concepts in determining it in the framework of the epistemology of C.I. Lewis. According to Lewis, there are three factors that determine how we experience what we experience. These are the given element in experience, the concepts we use to interpret it, and the actual act of applying some concepts to make sense of what is given in experience. While what is given is rooted on how things stand independently of an observer, observation itself is always delimited and guided by concepts. According to Lewis, concepts guide our attention to what is given in experience. Therefore, concepts enable us to classify and differentiate various elements of experience. A further consequence is that even the most fundamental classifications we make are dependent on the concepts we use. In other words, what we take to be real depends on not only what is given to us, but also on how we interpret it. The classification of experiences as real and unreal depends ultimately on the fundamental conceptual commitments we have made. If a culture employs conceptual classifications where dreams are given a deeper reality than in the Western culture, then for that culture, dreams are very real. Dreams, illusions and hallucinations are no less given to as as are tables and chairs. The fact that we rule the former as unreal and the latter as real depends simply on the conceptual commitments we have made regarding such experience. The ultimate criterion of the real is, according to Lewis, how we classify what is given to us in experience. What is real and what is not is, therefore, ultimately thoroughly conceptual. Quine has described his philosophical position as ‘unregenerate realism’, a realism that arises from his naturalism, the view that the philosopher operates from within our current theory of the world and thus accepts many of its ontological commitments. On the other hand, Quine’s position has been described as a form of anti-realism, especially with regard to his epistemological view of objects as posits. Indeed, especially in his later philosophy Quine was explicit about the ‘indifference of ontology’ to the empirical content of theories, which is the only kind of content Quine is willing to countenance and which he sees as sufficient to guarantee the intersubjectivity of science. On Quine’s epistemological model, both the existence and the identity of an object are dependent on the theory in which the object is assumed; or so I propose to interpret Quine. Quine’s model thus contains, in addition to his realism, a strongly idealistic strain. Following Roger F. Gibson, I shall argue that the key to reconciling Quine’s unregenerate realism with his idealism lies in his view of the ‘reciprocal containment’ between science and epistemology. Quine’s epistemological conclusions about the nature of objects are not to be understood as part of a ‘first philosophy’ that declares that the objects of common sense and of scientific theory do not really exist—for the Quinean naturalist, they are as real as it gets. Quine’s conclusions should, however, be seen as a theory of what these objects are like. Quine’s idealism has important consequences which Quine failed to fully articulate. To illustrate this, I will conclude by briefly considering, from the point of view of Quine’s theory of objects, two philosophical topics that were of interest to him: de re modality and de re propositional attitudes. I received my Ph.D at the University of Tampere in 2010. The title of my dissertation is “Quine’s Critique of Modal Logic and his Conception of Objects”. My opponent was professor Susan Haack (University of Miami). Since receiving my Ph.D, I have worked as a post-doctoral researcher at the universities of Tampere and Uppsala. In my recent work I have mostly focused on the philosophy of W.V. Quine and discussions concerning it, both systematic and exegetical. I have argued for an understanding of Quine’s rejection of de re modalities that is based on an interpretation of Quine’s view of objects as posits. Currently, I am studying themes related to Quine’s philosophy, most importantly the role of social cognition (empathy) in Quinean epistemology and philosophy of language, and problems related to the ascription of de re propositional attitudes. For Richard Rorty’s pragmatism the cash-value in any talk of ‘realism’ is to think that there is an accurate way to represent reality. Otherwise the notion of the world totally independent of our means of describing it is as “empty as Kant’s notion of Dinge an sich”. So, if one drops out the issue of representation, as Rorty recommends, the issue of realism does not arise at all. This is an infamous idea Rorty’s first time expresses in his landmark essay “The World Well Lost” (1972); ever since ‘antirealism’, in the form of ‘antirepresentationalism’, marked a definitive feature of Rorty’s neopragmatism. However, what interests me is the intellectual development – what Paul Gascoigne calls ‘Rorty’s Kehre’– that caused Rorty to make this conclusion that there is no role for any “realistic intuitions” in his version of pragmatism. I will argue that it was caused by the result of taking the metaphilosophical significance of the ‘linguistic turn’ for granted, and then reconsidering its application to the doctrine of eliminative materialism in philosophy of mind. My argument is that the crucial factor for ‘Rorty’s Kehre’’, especially including his ‘antirealist turn’, is his reading of Davidson’s critique towards the ‘dualism of scheme and dualism’, which I will discuss in detail. According to the New Pragmatists the notion of objectivity is not foreign to pragmatism. But what can here be meant by objectivity? Construed as a commitment to metaphysical realism, the notion seems fundamentally at odds with pragmatism; as ‘agreement within a community’, however, it appears superfluous and cannot be what is meant by the recent invocation of the term. As Rorty, favouring the latter construal, complaints: “Brandom could … say everything he needs to say about objectivity without ever talking about “answerability to the world” or “world-directedness”.” How, then, can talk of objectivity mesh with pragmatism? One impetus to the recent reinterpretation of pragmatism, which takes talk of objectivity to be compatible with pragmatism, is John McDowell’s anti-anti-realism. While sharing Rorty’s anti-Cartesian stance, McDowell argues that this does not force us to slight the notion of objectivity – of being answerable to something other than ourselves. Instead, he accuses Rorty’s pragmatism for being “half-baked, according to standards set by his own account of what pragmatism is” in being “organized around the dualism of reason and nature.” McDowell’s anti-anti-realism – in banishing the last vestiges of dualism – could thus be read as improving on Rorty’s pragmatism. In the following essay I seek to argue that McDowell’s anti-anti-realism can provide a notion of objectivity congenial to a revised pragmatism. In section I, I sketch and defend McDowell’s anti-anti-realism as it comes out in his discussion with Michael Dummett. Section II argues that the particular position emerging can yield a notion of objectivity compatible with a revised pragmatism. Section III compares the anti-anti-realistic notion of objectivity with the notion operative among some New Pragmatists, notably Jeffrey Stout and Bjørn Ramberg, and concludes that anti-anti-realism and new pragmatism are mutually reinforcing in accounting for a notion of objectivity that can be accommodated within a revised pragmatism. Eirik Julius Risberg is a second-year PhD. student in philosophy at the University of Oslo, currently working on a dissertation on singular thought. As part of the dissertation, he explores the recent spate of interest in the issue from a pragmatism that seeks to accommodate a notion of objectivity. Risberg has previously completed an M.A. in philosophy at the University of Oslo on John McDowell’s Mind and World. He has been a visiting student at the University of California, Berkeley, and at the University of British Columbia, Vancouver, and will spend the academic year 2011-2012 as a visiting student at University of California, Berkeley.